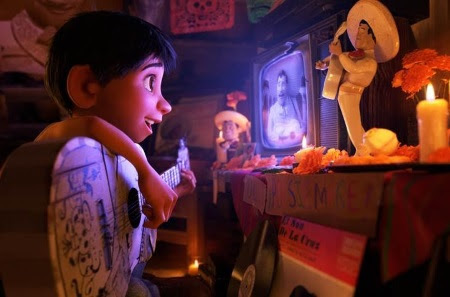 In Disney*Pixar’s COCO, Miguel's love of music and need to play, is the driving force behind the adventure he goes on in the film. So I'm glad I was able to learn about the films music while in San Francisco for the #PixarCocoEvent. Miguel recycled an old guitar, patching it up and painting it to mirror Ernesto de la Cruz’s signature guitar. All of the guitar playing in “Coco” is technically accurate. Filmmakers videotaped musicians playing each song and strapped GoPros to their guitars to give animators reference footage. To make sure it was authentic, they used local musicians to help create music you would hear if you went to Mexico. During the presentation, we also got a first look (and listen) at Ernesto De La Cruz icon guitar, which was recreated by the traditional guitar maker German Vazquez Rubio. It was lovely to see it "live" and hear an actual tune played. 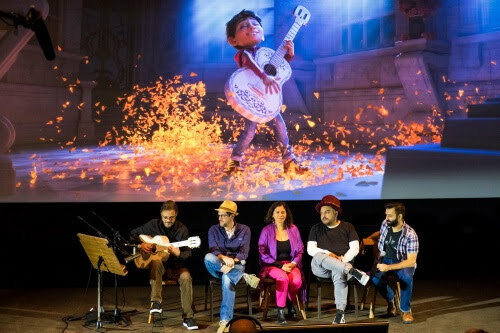 Truly, while watching, you'll be able to feel both the love from the characters for music and from what the filmmakers put into making the music for Disney*Pixar COCO.